Rep. of the Vice-Chancellor, the DVC (A), Prof. Toyin Arowolo making a speech at the occasion while from left are the Guest Speaker, Prof. Lekan Oyebande, Rep. of the Minister of Water Resources, Mr. Patrick Nlekwa, Rep. of Ogun State Governor, Engnr. (Mrs.) Monsurat Agboola, and the President, NAHS, Engnr. (Prof) Constantine Mbajiorgu listen attentively. The Minister of Water Resources, Mrs. Sarah Ochekpe has called on stakeholders in disaster management, to adopt a more scientific based approach to mitigation, managing and predicting the occurrence of disasters. The Minister who was represented by Mr. Patrick Nlekwa, a Director in the Ministry, made this known while delivering her keynote address at the Conference of the Nigeria Association of Hydrological Sciences (NAHS), held at the Federal University of Agriculture, Abeokuta (FUNAAB), titled “Hydrology for Disaster Management”. Mrs. Ochekpe in her speech described disaster as an unexpected event that kills a lot of people or causes a lot of damage, noting that water-related disasters such as flood, drought and desertification, occasioned by climate variability and climate change have inflicted untold hardship on the Nigerian populace, with its concomitant consequences on water resources, agriculture and environment, in recent times. According to her, “the country is being affected by the two Hydrological Extremes (Flood and Drought). As a result of drought, northern parts of the country, especially the far north-eastern part of Borno and Yobe States have been adversely affected such that there is scarcity of both surface and ground water in the region”. She expressed displeasure that the southern part of the country and indeed some northern parts of the country have experienced heavy flooding, resulting in excessive run off, causing severe damages to water and sanitation infrastructures, stressing that it has created pollution problems with the attendant incidences of out-break of water- borne diseases such as diarrhoea, cholera, dysentery, typhoid, fever, amongst others. In combating the menace of disaster in the country, Mrs. Ochekpe said since assumption of office as Minister of Water Resources, her ministry through Nigeria Hydrological Services Agency (NIHSA) has evolved contingency plan, by providing information on the effects of climate change in the country through the establishment of some hydrometric stations equipped with Telemetric Data Collection Platforms (DCPs) on the River Niger and Benue Systems, as well as generating real-time data and information. 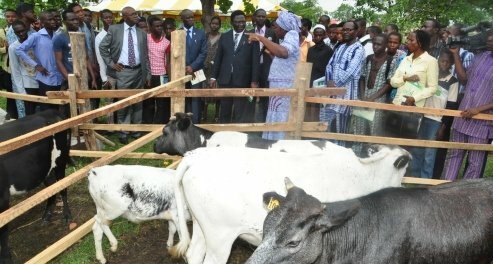 “Furthermore, my Ministry has through NIHSA, established a Pan-African Monitoring of Environment for Sustainable Development (AMESD) reception network, supported by the African Union and European Union which involved application of satellite data to monitor water bodies, vegetation growth and environment, for the purpose of informed decision-making at different levels on disaster management”, she added. Mrs. Ochekpe, sought the cooperation of the Association for effective and efficient management of the nation’s water resources, adding that the Association in collaboration with relevant Agencies of Government should pay prompt attention to providing the best solutions to the problems of floods in Nigeria. Earlier in his speech, the University Vice-Chancellor, Professor Olusola Bandele Oyewole lamented Nigerians apathy towards prevention and management of disaster. Represented by the Deputy Vice-Chancellor, Academic, Professor Toyin Arowolo, the Vice-Chancellor declared that it is high time for the nation’s leadership and followership to work collectively towards checking the menace of disaster. He assured that the University on its path will continue to offer courses that are corrective of environmental lapses and degradations. The Chairman, Local Organising Committee (LOC) of the conference, Professor Olasunbo Martins of FUNAAB spear headed the formal launching of the Association In- House Journal.